I’ve been collecting ideas, quotes and inspiration on Pinterest for about a year now. I love having a place to collect so much visual goodness. But as most people who use Pinterest know, most of those ideas are still sitting there, unused. So I’m hatching a few ideas of my own to change that. Today I want to share this great idea I found for making a drying rack for crafts. The original pin that I found did not link to a source and I like to give credit for ideas that I borrow, so I searched Pinterest and found one that linked to this blog post showing the idea in use in a preschool classroom. I, of course, want to use it for messy, inky scrapbook pages. One of the things that holds me back from doing more art journalling and messy scrapbook pages is drying time. I’m not patient. I’m easily distracted when I do have to wait and then when I come back to my projects I find that I’m in a different mindset than when I started. It would be great to be able to make a batch of messy backgrounds all at once and have them handy when I want to play. We don’t have pizza boxes, though. We live outside the free delivery range of our local restaurants, so we never order pizza. 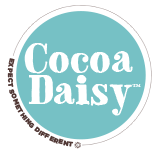 But I do have hoarding tendencies when it comes to my Cocoa Daisy kit boxes and they are perfect for this project. They’re a bit deeper than your average pizza box, so the drying shelves should have plenty of room. It took less than half an hour to cut off the front flaps of the boxes and use my handy ATG to stick them together in a stack. I might add some tape around the outside, but they seem pretty sturdy as they are. Here’s the finished drying rack in my closet ready to hold some messy pages while they dry. I’m not sure if this will be their final home, I might move them into my ‘art cave’ next to my scrapbook room/office because that’s where most of my messy supplies are stored. But for now, I want it handy to where I spend most of my time. Fantastic idea! I love Pinterest, too, and need to put more of my pins to good use.